The talented voice actors who bring Connie Kendall and Eugene Meltsner to life from week to week on Adventures in Odyssey have written their own book to share some of their memories from the past 30 years. It’s called Adventures in Oddity, and it lives up to its name. The book is a conversation between Will Ryan (voice of Eugene Meltsner) and Katie Leigh (voice of Connie Kendall), and if you read from cover to cover, it all happens so fast. Once you start the book, it’s hard to put down because the conversation between the two draws you in and takes you on a comical ride. Having read the book myself, I must say it was intriguing from start to finish. Adventures in Odyssey co-creator Phil Lollar brings you the Foreword, a perfect addition to the book from someone who was there from the beginning of Adventures in Odyssey. Adventures in Oddity is a light-hearted, informative peek into the inter-relating minds and personalities of two veteran voice actors and the characters they bring to life. 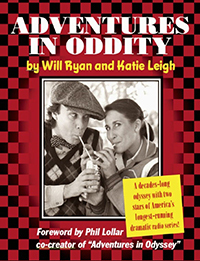 Katie Leigh and Will Ryan, a pair of voice-over professionals with thousands of film and television credits between them, interview each other regarding their work on America’s favorite dramatic radio series “Adventures in Odyssey” (heard on over 2,400 radio stations in North America since 1987). The dialogue also touches upon their work as voice actors on some of the most popular film and television successes of all time. Included are illustrative cartoons by co-author Will Ryan, past-president of the International Animated Film Society. Fans of Adventures in Odyssey will certainly find this to be a fun companion piece to the series. You can order your copy at Katie Leigh’s website.